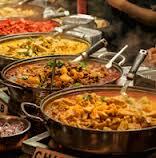 The cuisine of India is famous for its use of spices, herbs and other exotic ingredients. The style of cooking and flavors differ in every part of this country. India is well known globally for its diverse cuisines and a large assortment of dishes served with unbeatable hospitality, dishing bliss-on-a-platter to the food lovers. The Indian cuisines most popular with the travelers are Mughlai and delicacies from the North-West Frontier epitomized by the ITC Bukhara in New Delhi. Mughlai cuisine is an ancient technique of cooking developed in the India in the royal kitchens of the Mughal Emperors. It has been influenced by the cooking styles of multiple lands developing a unique and rare blend – several delicacies with spicy to mild flavors, with a lingering rich aroma of whole and ground spices & herbs, assortment of meats cooked as kebabs or relished with gravies, and an assortment of mouth-watering breads. North Western Frontier brings to us the Peshawari cuisine, a rustic and delectable style of cooking. In this cuisine, large pieces of vegetables and meats are marinated and prepared at high temperatures in the tandoor (clay-oven), to keep the food tender and moist. The spices, herbs and flavors used will suit every palate – of course with adjustment of chilies to taste. Apart from these, there are many regional cuisines famous among the tourists like Punjabi food, Rajasthani food, Bengali dishes, Gujarati wholesome thali, Malabar cuisine, Kashmiri food, Awadhi cuisine and delicacies of Chettinard and North Eastern cuisine. The changing times and innovation has also led to localization of many international cuisines, still the original recipes stick out for their authentic taste. India Fusion food has made rave around the world. The cuisine that stands out is the Fusion food. Its origin can be traced back to the British rule in India, where the British and Indian cuisines were fused to create new delicacies. From that time onwards, people have gone ahead and combined foods from various countries together to create a whole new selection of dishes. 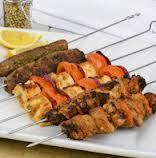 This cuisine can be found in metropolitan parts of the country, with different preparations to suit different regions. India’s celebrity, New Delhi born Chef Suvir Saran opened the DeviRestaurant in New York to great reviews. And it is the first Indian restaurant in the U.S. to have earned a Michelin star. The restaurant offers a unique blend of authentic Indian home cooking brought together with traditional and regional delicacies. Chef Manish Malhotra of the Indian Accent at the Manor showcases Indian food for the 21st century with a remarkable creation of fusion specialties. Awarded the best restaurant all India by Time Out, Indian accent, offers a range of tasting menus that are a must try – for one and all!! Tandoori Chicken – a savory dish made with marinated chicken, cooked in a clay oven with several spices.